Do you want a relaxing, luxurious beach holiday? Then look no further than Nusa Dua! A beautiful white sandy beach lined with palm trees, and a protected lagoon offers excellent swimming conditions in the blue waters, outer reefs perfect for surfing. 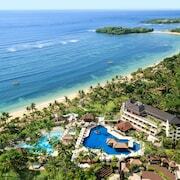 We have a Nusa Dua beach hotel for you! 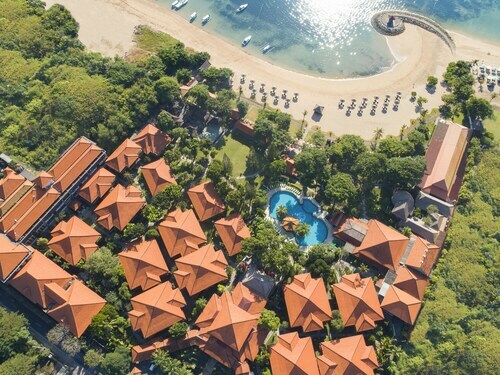 Our Nusa Dua hotels provide the luxury that you are looking for: tranquillity, landscapes, lush colours and pampering all at the doorstep of the white sandy beach and crystal clear waters. There are plenty of water sports to be enjoyed off Nusa Dua beach: snorkelling, scuba diving, jet skiing, parasailing and kayaking and of course surfing (from October to April when the big waves arrive). The scenery surrounding the international golf courses is amazing; enjoy a sunset tee off, challenging fairways and excellent greens all immaculately landscaped. Nusa Dua has a comprehensive international shopping complex with trendy fashion brands (both international and local), art and craft and jewellery. For the ultimate pampering at the end of a day spent relaxing or exploring Nusa Dua book yourself in for a massage and treatment... you’ll be a new person when you’ve finished at the day spa. Step away from the sandy beach and crystal waters, and visit the local area such as Batubulan village with its traditional Barong dance; or Mother Temple of Besakih, the biggest Hindu temple in Bali, located on the slopes of Mount Agung. Or take a tour to Serangan Island (Turtle Island) and visit the Turtle Conservation and Education Centre and the Balinese temple, Pura Sakenan which was built in the 16th century. Breathtaking views, amazing interiors, first class service and delicious international cuisine await you at one of the many restaurants. 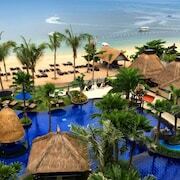 You will enjoy a luxurious beach holiday in Bali when you stay at your Nusa Dua hotel. How Much is a Hotel Room in Nusa Dua? 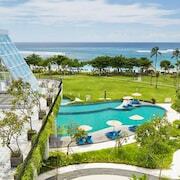 Hotels in Nusa Dua start at AU$43 per night. Prices and availability subject to change. Additional terms may apply.